A NEW family musical! This spirited and joyous adaptation performed by an all-teen cast celebrates life, love and home set against the background of the American Civil War. A timeless story that has captured the hearts of readers for nearly 150 years! Be inspired by all the adventures, hopes and dreams of unforgettable sisters Meg, Jo, Beth and Amy. 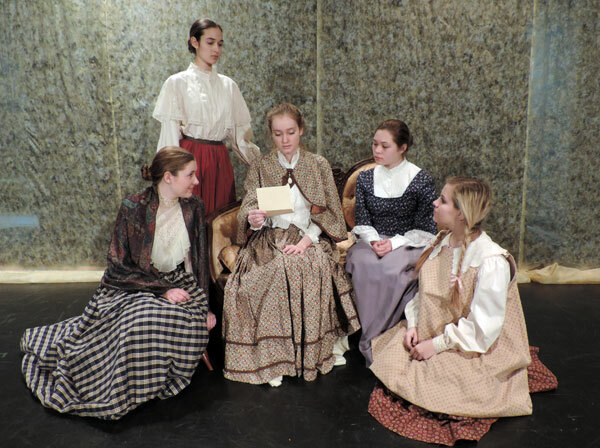 B.Wolf created the music and lyrics for the production of “Little Women” including “An Operatic Tragedy,” a melodrama mini-opera by the March girls as well as “Aunt March,” emphasizing a clashing of personalities between Jo and grouchy Aunt March. “The Great River of Life” is the finale and gives people an inspirational feel as they leave the show. DCT’s teen and young adult programming focuses on issues and interests of the underserved teen audience. In response to the many requests for more performance opportunities for teens, DCT’s Academy introduced the Teen Scene Players, an advanced acting training course for young adults, with an added level of professionalism by including public performances. All classes taught in the DCT Academy culminate in a presentation for invited family and friends on DCT’s stages, however, the Teen Scene Players class culminates in a DCT Season Special performance open to the public. Attend the show on Valentines Day, Friday, February 14 and enjoy an opening night reception following the play complete with a celebratory mini-cupcake treat from our friends at Sprinkles Cupcakes. Also, get some great giveaways including a free poster for each family.